If you live in Georgia and want to begin your first job, you'll need to know what the minimum legal working age is. Are you old enough to be hired? Working can be a rewarding experience for young people. It can teach you how to be dependable, punctual, set financial goals and not live beyond your means. If you're on your own, it can keep you out of harm's way and help you support yourself and any family members who may rely on your income. Federal child labor laws state that the minimum age to work is 14, but Georgia has set the minimum age at 12. However, that only applies to employers that are not subject to the federal Fair Labor Standards Act. When state law contradicts federal law about the minimum age to work, the strictest law will apply. Children who work in the entertainment industry (actors, singers, dancers, models etc.) are considered exceptions to the rule and can work, despite child labor laws. The same goes for children working in the family business or on the family farm. 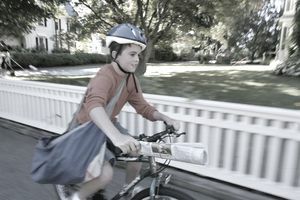 Child labor laws do not apply to a number of jobs, including some types of yard work, babysitting, shoe-shining, and newspaper deliveries. Before youth start working, it is important to review the rules and restrictions regarding child labor laws, particularly if juveniles plan to keep working as they age. Georgia state law requires child employment certificates for youth under age 18. Employment certificates are provided by the school. Age certificates aren't required in the Peach State. Although teens ages 14-15 can work in a variety of jobs, including in offices, hospitals, and retail stores, the hours they work are limited. Youth this age can't work more than four hours on a school day, eight hours on a non-school day or 40 hours during a non-school week. Additionally, these teens must work hours that fall between 6 a.m. and 9 p.m. Minors 16 and 17 years of age have no work hour restrictions. Just because these teens have no restrictions doesn't mean parents should let them work as many hours as they choose or their employer wants them to work. If a teen's job is interfering with school or may put the youth in a dangerous position because of late (or very early) hours, parents should take caution. Teens are at more risk than adults both as workers and on the streets, and it may not be a good idea to have a teen leaving the house in the wee hours of the morning or returning home from work late at night, especially if they're responsible for closing up shop. Teens have been robbed, raped, and otherwise harmed on the job. Youth of all ages may not work in hazardous conditions that might cause injuries, death or adverse health effects. For more information on the minimum age to work in Georgia and how to obtain employment certificates, visit the Georgia State Labor website.